About a year ago Eric at Lunacycle decided that he really wanted to provide a quality fat tire front air suspension fork for the Sondors ebike. The problem is that every single air fork on the market uses through-hub axles and not a standard vertical dropout axle. In order to mount a through hole fork on the Sondors ebike the consumer would have to swap out the hub on the front wheel or get an entirely different wheelset. After some back and forth Eric ordered hundreds of a new air fork that he was convinced would be successful in the US market. I have to admit that the Luna Lander Fat Tire fork has exceeded my every expectation and is by far the nicest $195 air suspension fork (available here) I’ve ever ridden. Although the market is now crowded with fat tire suspension forks including Rockshox Bluto, Renegade RST, and Wren Inverted forks I have yet to test any fork that provides the Luna Lander’s level of performance at anywhere near the price. I’ve been testing the Luna Lander for almost 6 months now on a variety of different ebikes. It seems to fit most of the tires I throw at it and with many hours of riding I have not had a single issue with it. I don’t do anything maintenance wise with my forks other than wiping down the stanchions before every ride and making sure that there is sufficient air in the fork. 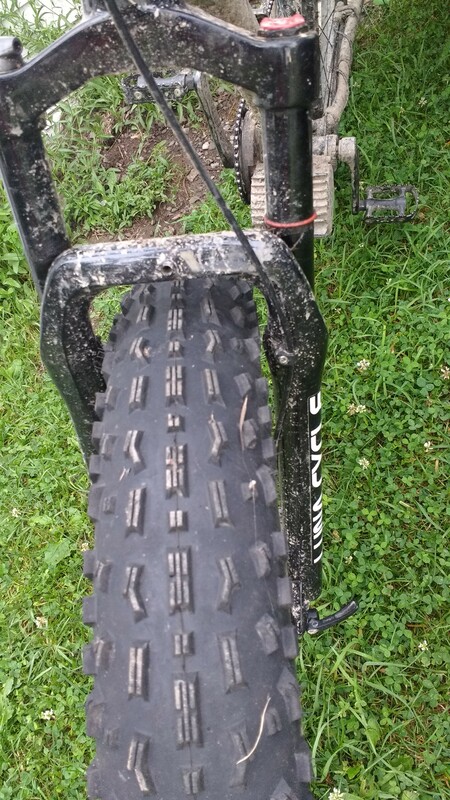 This article is about the last 6 months of testing and why I think that the Luna Lander is the best value in fatbike forks on the market right now, even though it is currently not serviceable (although they might be in the future). One of the first times I tried the Luna Lander was on Curt Fisher’s Luna 72v 3000W Rhino Cargo ebike. We were going to go riding and it was the only ebike he had to loan me (don’t ever loan me your ebike). Although the Rhino was ridiculously heavy (over 60 lbs) and had no PAS system I still found myself having a really fun time on the trails with it. I can’t even imagine taking a cargo bike singletrack riding without some kind of suspension for on it, even if it was a fat bike. I was impressed at the performance and that it had a remote lockout system which is a nice feature to have and allows you to lock the fork in place from a switch on the handlebars. I had a great time and didn’t feel out of control any more than I usually do on that particular ride. Somehow I managed to not break the bike. Two years ago I installed a $89 steel spring Luna fat bike suspension fork (review here) that I was pretty excited about. 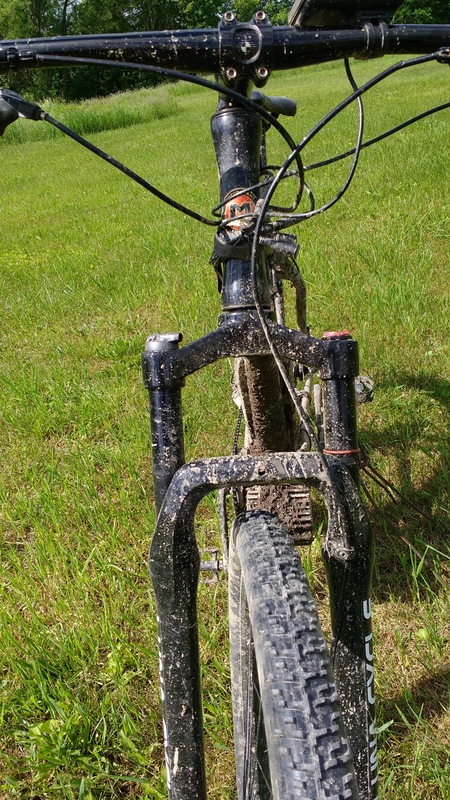 Although it worked well the first year during warm weather, in the wintertime I took it out on the trails and the grease on the stanchions thickened up and the fork just completely stopped working. Long story short, that fork ended up in the trash and I chalk it up to a failed experiment. I’ve had most of the steel spring forks I’ve owned die after 2-3 years and so that is pretty much what I expected to happen. That being said, I still have high hopes for the Luna Lander as the oil seems much less thick and not so much like grease and although I have not yet tested it in the snow. I’m really hoping it doesn’t have the air leakage problems that the Bluto fork does (fingers crossed). I have 2 Bluto forks which I love (review here) but they just don’t work right in the wintertime and I don’t have the time and inclination to swap out the seal sets for ones that actually will work in cold weather. I’ll post an update to this article after I thrash on the Luna Lander in the snow for a couple of months this winter. 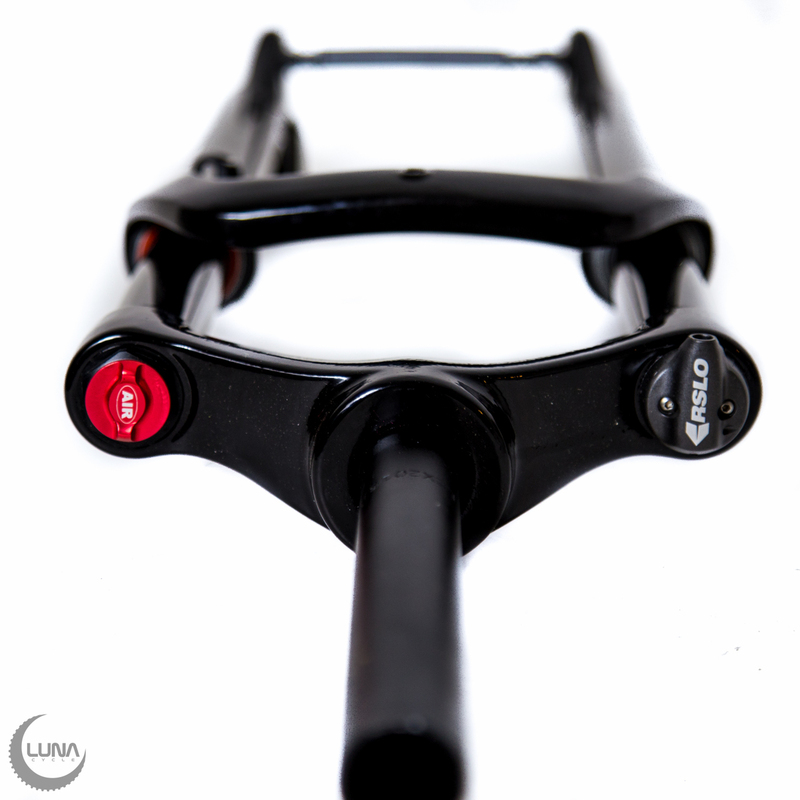 The Luna Thin ($219) is very similar to the Luna Lander, only designed for normal sized tires & 100mm hubs. The Thin is for tapered head tubes and through axle hubs. The Luna Lander is about 2 lbs heavier than the Bluto but is also $400 cheaper. Suspension forks that you pay more than $500 for will almost always have a rebuild kit available, but the Luna Lander does not. My bike mechanic says you are supposed to rebuild the seals on your forks every year. I do it religiously about every decade without an issue. I find that more important than regular rebuilds, is storing your bike inside and wiping the stanchions off before every ride, and never ever putting the bike on the outside of your car when there is salt on the roads. An ounce of prevention will save you hundreds of dollars on bicycle maintenance. 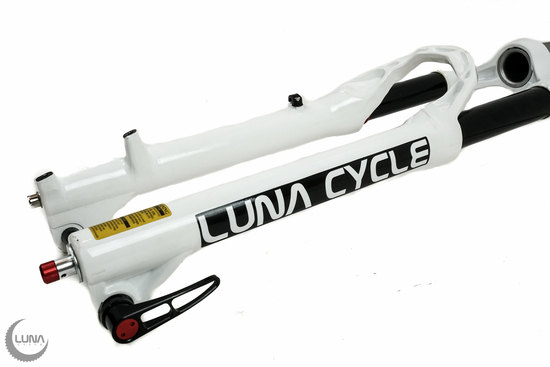 If you’re looking for an inexpensive fatbike air suspension fork for a 1 1/8″ Straight headtube and already have a front tire with 135mm Quick Release dropout width then the Luna Lander is going to be your best bet. Even with thrashing on this fork for several months I had no issues and no air leakage. 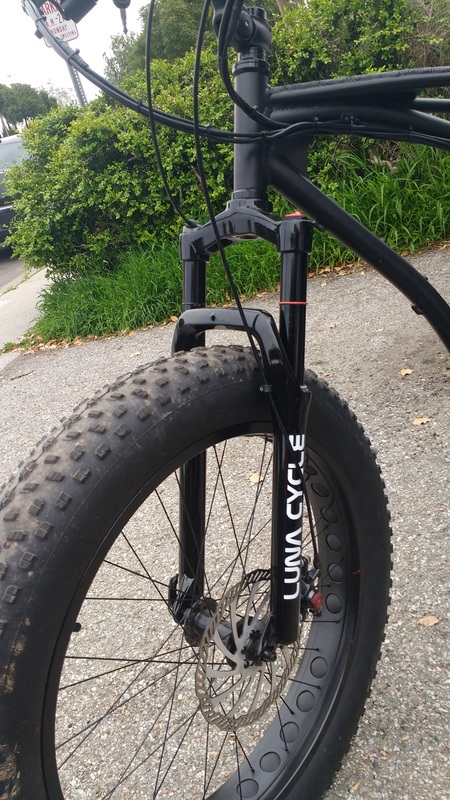 I’m not sure why fat bike suspension forks are so ridiculously expensive and hard to find, but the Luna Lander is a game changer for sure. UPDATE : Testing this fork in extreme cold weather (about 10 degrees F) it finally blew out. I have yet to find any suspension fork that will deal with the extreme cold, if you know of one please let me know. Will probably order a Luna Lander, of coarse the stock tire is 4.9 x 26′ so since these are targeted just for the Sondors I imagine they should work with enough clearance? Also, would it be a good idea to order a new crown race and install that on the new fork and just leave the old one on the old fork so it’s less hassle if you want to swap back and forth? Different manufacturers claim wildly different tire widths on their tires. The Sondors ‘4.9 inch’ I’m quite certain will fit in the lander but the 4.8″ Lou will on a 100mm rim will not. On a 80mm rim a Bud or Lou will fit with less than 1/8″ of clearance on both sides. I updated the article to reflect this. It’s frustrating that the manufacturers don’t standardize the tire sizing system. It’s expensive as hell, but the Manitou Mastodon looks like the best fat fork solution I’ve seen. Supposed to be cold and heat tolerant and support 5″ tyres. Will this fit a RadRover? Depends on the width of the head tube. I can’t find the specs online, pull off the neck and measure it with calipers. fits the Rad Rover 2017 perfectly. And it’s 2 lbs lighter and way better then stock metal spring fork. Matches better too with flat black finish. Get One. Just installed my Luna Lander with the new-ish dampener option. It fits a 4.9″ Chaoyang on 80mm rims fine. Fine meaning it doesn’t rub but don’t stick your pinkie finger in there when its spinning. Yeah that’s the big disadvantage of the Luna fork that it’s not user serviceable. Nah, it’s clearly serviceable. I’m pretty sure this is a Suntour Epixon with a widened crown, OEM’ed by Suntour for Luna. RSLO lockout indicates it’s definitely a Suntour, and the stanchions diameter and air spring indicate Epixon. Remember, Suntour will make anything you want if you throw a big enough order at them. I would be very surprised if seal kits for the Epixon don’t work perfectly on this fork.